We are now halfway through the main season of the Summer Tournament. This week is a break week while teams prepare for the next two weeks of games where they will be fighting for spots in the Finals Weekend and Wildcard Tournament. Speaking of which, before we dive into this week’s recap, here’s all you need to know about the postseason. After two more weeks of games in the main season, the 13 teams with the most championship points will be invited to continue playing in the postseason. The top 3 teams will automatically qualify for the finals weekend. The next 10 will move into the Wildcard Tournament where they will be competing for the final slot in the semifinals. The finals will be take place over the space of a weekend with best of three semifinals on Saturday 5th September and the best of five grand final on Sunday 6th September. This week’s featured match is between two teams from lower down in the tournament: “Bangors and Mash” and “Staffs MEH”. The beginning of the game is uneventful. Neither team invades and everyone goes into standard lanes. First blood goes to the Staffs team 6 minutes in when Ludvan on Shyvana enters red-side tri-brush top lane to try to gank Odium on Maokai. Instead what happens is he gets cut off by NiftT’s Rek’Sai coming up river and then is killed in the ensuing 2v2 fight. The next few minutes are mostly filled with the laners laning, but creep score gaps do begin to open up in places. By 10 minutes Maokai is 20cs up but this is balanced out by Annie (played by Fakado) being 20cs down (after narrowly escaping dying 1v1 to Zxcrin’s Viktor). Annie’s laning disadvantage is easily corrected however, when a Tibbers stun into Rek’Sai knockup results in an easy kill on Viktor and then the gifts first dragon of the game to Staffs. Despite the dragon being down, the teams manage to congregate for a 4v4 fight around the dragon area at 14 minutes in. Bangor take the fight victory, picking up a double-kill for Sivir (played by No Gold for you). After both teams heal/respawn and head back to lane it’s clear that the Staffs bottom lane duo underestimate the power this has given Sivir as she is immediately able to pick up a kill on Rhysjura’s Vayne before taking the Staffs bottom lane tier-1 turret. This gives Bangor a gold lead of nearly 2k. Staffs claw back a bit of the gold at 17 minutes when Rek’Sai leads an engage at blue-side Raptors. 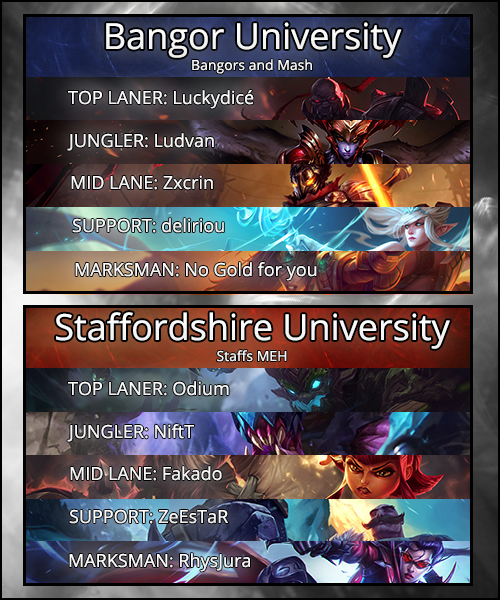 As both teams collapse in, Staffs are able to pick up two kills to Bangor’s one allowing them to take their second dragon. At 19 minutes another engage happens, this time in top lane. Somehow the three Bangor champions that Annie gets a Tibbers-stun on escape to the safety of their turret (ZeEsTar’s Janna surely on sub-10 health). They are then too low to protect said turret and are forced to give it up, though Viktor takes down the Staffs mid tier-1 turret to balance it out. 22 minutes in, in mid lane Rek’Sai gets another good engage, this time with a Flash-knockup onto Sivir. With the entire team at his back and Bangor’s Sion elsewhere the team pick up kills on Sivir, Viktor and Shyvana, though they lose Rek’Sai to the turret. They then take the turret with ease and nearly pick up more kills when Sion arrives. The gold is still very close, with Bangor being a mere 300 up. The third dragon of the game has spawned by 24 minutes. Whilst in the process of setting up for it, Staffs catch out and kill Janna. However the rest of Bangor collapse in on them and they give up three deaths and concede the dragon. The first major gold swing happens at 29 minutes. Bangor push up to the Staffs tier-2 mid turret, but Annie is just over the wall in fog of war. This gives her an easy opportunity for a 4-man ultimate, which she takes happily. Though Annie dies in the fight, Staffs get an ace and then Baron Nashor for it. They now have a 3k gold lead. They use the baron to get their third dragon and bottom tier-2 turret which Bangor don’t contest. This extends their gold lead to 5k. With Maokai 50cs up on Sion and Vayne having 6 kills things are looking good for Staffs. A few minutes later Annie gets yet another engage with her ult and trades her life (again) for two kills and Bangor’s bottom inhibitor turret. Bangor aren’t going to give up that easily though. At 35 minutes they search for a comeback fight by catching out Maokai top lane. But he is far too tanky and that lets his team collapse and pick up an ace (though Annie trades her life for it again). Staffs immediately charge down top lane and take the inhibitor there. 37 minutes into the game Bangor try again for a pick, this time they are successful in catching and killing Rek’Sai alone in mid lane. They rotate immediately for Baron and take it uncontested, as Staffs take their 4th dragon in return. The baron doesn’t help much when Staffs force a fight in mid lane at 38 minutes. They engage on Janna but let her go and switch to kill Viktor, Sivir and Shyvana as the rest of the team collapses in. This allows them to charge into the base, take down the last two inhibitors, finish the kill on Janna and take the first nexus turret. This takes long enough to allow Bangor to spawn. In the process of chasing Staffs out Bangor succeed in killing everyone but Rek’Sai, including giving Maokai his first death. They lose both their carries for it and their final nexus turret to minions however. Without a turret left on the map there is nowhere left for Bangor to hide without giving up the game. They try for one last fight when, at 42 minutes, Staffs return to their base to end the game but they can’t hold back the team with a nearly 10k gold lead. Staffs kill a few of them then finish the nexus. Staffs MEH win the match. Picking an MVP for this match was insanely difficult. Maokai was the only one to win lane and didn’t die until the victory was effectively in the bag. Rek’Sai carried the early game and had joint highest kill participation (with Braum). Annie’s engages with Tibbers were on point the whole game. Vayne just got insanely fed and Braum allowed her to do it. If there was ever a game where the whole team carried equally, it would be this one. But that doesn’t help me choose. Thanks for pointing this out. I’ll fix it now.